Home > Scottish Steel – a lesson from history? Scottish Steel – a lesson from history? Scotland’s steel industry is facing a crisis. As this brief history shows, the industry has experienced other crises in the past. The most acute occurred in the 1920s and 30s. In response, a bold plan to concentrate steel production near Erskine Ferry on the Clyde was proposed in 1929 but not adopted. 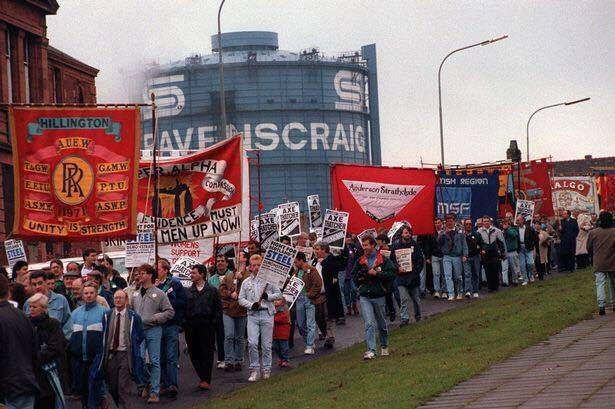 The plan was proposed again in 1945 but rejected in favour of developing what became the Ravenscraig plant which opened in 1963 and closed in 1992. Will independence lead to better decision making about the future of major Scottish industries? Possibly, but as the history of Scotland’s steel industry shows, making the right decisions is immensely difficult. And divisive. I conclude that it would be better to start thinking and discussing the difficult decisions now- even at the risk of division- rather than waiting until after independence. Scotland’s steel industry has its origins 350 million years ago when layers of iron bearing rock were intermingled with layers of coal in what was to become west central Scotland. Although the first use of iron produced using charcoal occurred 3200 years ago, coal in the form of coke has only been used to produce iron for 300 years. In 1759, first use of this new technique in Scotland was pioneered by the Carron iron works. However as late as 1825, annual Scottish production of iron had only risen to 25 000 tons. In contrast, South Wales was producing 150 000 tons of iron annually by the 1820s. The problem was that most Scottish coal had a low carbon content. This meant that to produce one ton of iron, 8 tons of coal had to be turned into coke, twice as much as was needed in Wales where the coal had a higher carbon content. As a result Scottish iron was more expensive than Welsh iron and only the high cost of transporting Welsh iron to Scotland kept the local iron industry going. This situation was dramatically reversed after 1828 when James Neilson from Glasgow discovered that pre-heating the air used in iron smelting furnaces improved their efficiency. Now only 3 or 4 tons of coal was needed to produce one ton of iron. It was soon found that raw Scottish coal and blackband ironstone (which was a mixture of iron ore and coal) could be used directly in the blast furnaces. This cut the cost of Scottish iron so it became competitive with Welsh iron and led to the rapid growth of the iron industry in north Lanarkshire and Ayrshire where coal and iron were found in close proximity. However, before the iron could be used to build bridges, make rails for railways or plates for shipbuilding it had to be converted into wrought or malleable iron. This involved re-melting the iron and working it in ‘puddling’ furnaces. Here in a physically exhausting and high skilled process molten iron was stirred with iron rods. The end product was iron which could be rolled into rails, beams and plates. In Scotland, the companies which produced the wrought iron were separate businesses from the ‘raw’ iron producing companies. In 1857 one of the wrought iron making companies tried to mass produce steel using the Bessemer process. This failed due to the high phosphor content of Scottish pig iron. Ten years later the rival open-hearth method of producing steel was perfected and this was the process adopted in Scotland. Steel was cheaper to produce than wrought iron. Scottish shipbuilders soon adopted the new material. Between 1879 and 1890 the tonnage of steel ships launched in the Clyde grew from 18 000 to 326 000 tons. Scottish steel production grew from 1199 tons in 1873 to steel 585 00 tons in 1890. By 1913, Scotland was the world’s leading shipbuilder, launching 23% ( 757 000 tons) of the world’s ships. But as Scotland’s steel industry expanded, the once pioneering Scottish iron industry began to decline. Scottish reserves of ironstone were becoming exhausted by the 1870s and had to be made up by importing iron ore from other parts of the UK and Spain. Producers of pig iron did not enter the steel-making industry. Instead they expanded their coal-mining activities. The Dalmellington Iron Company in Ayrshire started producing iron in 1847 but its furnaces were blown out in 1921. However the coal mines which had fed the furnaces survived to be nationalised in 1947 and continued in production until 1978. After the First World War there was a brief boom in shipbuilding, but by the mid 1920s this petered out. This led to a crisis for Scotland’s steel makers. Although their plant was not quite as archaic as the iron makers, it was still embedded in iron embrace of Scotland’s Victorian infrastructure. To survive they would have to modernise and rationalise. In 1929, a bold plan to create a Scottish steel industry fit for the twentieth century was proposed by USA based consultants H. Brassert. The Brassert plan involved integrating and concentrating Scotland’s iron and steel production at new, coastal, site on the lower Clyde near Erskine Ferry. Here ships could bring in iron ore and coking coal to produce first cheaper iron then cheaper steel. The cheaper steel would then be sent up the Clyde to the shipbuilding yards and Glasgow’s locomotive and other steel using industries. It was a very bold plan. Too bold as it turned out. It would have meant drawing a line under 100 years of history which had made north Lanarkshire the centre of Scotland’s iron and steel industries. As well as constructing new industrial infrastructure, a new town would have been needed to house the workers and their families, leaving the towns and villages of north Lanarkshire as ghost towns. One Scottish company did adopt a bold strategy for survival, also based on advice from H. Brassert. Stewart and Lloyds was formed in 1903 by the merger of a Scottish company (Stewarts) and an English company (Lloyds). Lloyds had been using iron ore from around Corby in Northamptonshire to produce iron since 1880. Unlike Scotland, significant quantities of iron ore were still available in this part of England. This factor led Stewart and Lloyds to move their steel production from Scotland to Corby in 1933. In 1931 Corby had a population of 1500. By 1939 it was 12 000, including 4000 Scots who had moved with Stewart and Lloyds to Corby. The strongest opposition to Brassert’s Erskine Ferry proposal came from Colvilles. Colvilles favoured an alternative strategy based on rationalising existing production by taking over rival steel making companies. By the mid-1930s Colvilles had control of 80% of Scottish steel making. Colvilles original base was the Dalzell Steel and Iron Works which was opened in 1872. In the 1930s Colvilles acquired the Clydebridge and Clyde Iron works. The Dalzell and Clydebridge works, now owned by the Tata corporation, are [October 2015] to be ‘mothballed’ by Tata with 225 jobs lost at Dalzell and 45 at Clydebridge. A key feature of the 1929 Brassert plan was to physically integrate iron and steel production. Molten iron from blast furnaces would have been by directly converted into steel, rather than the iron having to be re-melted prior to conversion into steel. While rejecting the main parts of the Brassert plan, Colvilles did adopt this part of the plan. They built a railway bridge over the Clyde to carry molten iron from blast furnaces on the Clyde Iron site to the Clydebridge steel works. This project was completed in 1940 at a cost of £2.5 million compared to the £5.5 million estimated cost of the Brassert plan. As had happened in the First World War, demand for steel grew rapidly during the Second World War. However, there was no time to develop new facilities. Instead existing steel works were used to maximise production. With the Second World War drawing to a close, the prospect of a post-war revival of Scottish shipbuilding, leading to an increase in demand for steel brought the Brassert plan back to life in 1945. But just they had done in 1929, Colvilles argued strongly against this, proposing to upgrade and expand their existing plants instead. Then in 1948, with the prospect of nationalisation looming, Colvilles came up with a bolder idea- to create a brand new steel making facility in the Motherwell area. This became the Ravenscraig works. The Labour government’s iron and steel nationalisation act was passed in 1949, but it was not due to come into effect until February 1951. In October 1951 the Conservatives won a general election and immediately began preparing to return the iron and steel industry to private ownership. De-nationalisation took effect in 1955. Parts of the steel industry were later re-nationalised by Labour in 1967 to create British Steel. It was during the intervening period of Conservative government that the Ravenscraig steel works was built by Colvilles. Construction on the new site began in 1954, but even as the new plant was taking shape, in 1956 a proposal was put to Covilles by the British Iron and Steel Federation. This was to include a strip mill as part of the Ravenscraig development. The strip mill would produce thin sheets of steel, suitable for making cars and for light engineering. Colvilles rejected the idea, arguing that there was not enough coking coal available in Scotland to make the additional steel required. However the idea did not go away. The argument for the strip mill was political. Back in the 1950s, even Conservative governments were in favour of economic developments which would reduce unemployment. Unemployment in Scotland was twice the UK average. Two British vehicle manufacturers- Rootes and BMC (who made Austin and Morris cars) wanted to expand production in the English Midlands, but the Conservative government were keen to see them set up factories in Scotland as a way to reduce unemployment. In May 1958 Iain MacLeod MP, Minister for Labour, argued that ‘Scotland was without facilities for producing high class sheet and strip steel and, so long as this lack of facility existed, they could not expect motor car industries to set up in Scotland’. Furthermore, MacLeod argued that even if the strip mill made a loss of £4 or £5 million a year for many years to come, this would be ‘much less than the public assistance and unemployment benefit paid to men out of work in Scotland without such a development’ and that ‘the balance would be favourable to the general national economy’. Through 1958, the Conservative government put pressure on Colvilles to accept a strip mill for Ravenscraig, at one point threatening to authorise the Iron and Steel Board to build a new works in Scotland with government money. Finally, despite their reservations and with the offer of £50 million loan from the government, Colvilles agreed. On 18 November 1958, Conservative prime minister Harold MacMillan announced to the House of Commons that not one but two strip mills would be built, one in South Wales and one at Ravenscraig. The main part of the Ravenscraig site was completed in 1962 and the strip mill in 1963. In the same year, Rootes opened their Linwood car factory which produced the Hillman Imp. The British Motor Corporation’s truck and tractor making factory at Bathgate had already opened in 1961. Opened under one Conservative government, they were all closed under another. Linwood closed in 1981, Bathgate in 1986 and Ravenscraig in 1992, although by then John Major had taken over as prime minister from Margaret Thatcher. These and other closures have been called Scotland’s industrial clearances. The connection between Scotland’s industrial clearances and Margaret Thatcher’s economic policies became a central theme of the Labour party’s approach to Scottish politics. Labour argued that only strong support for Labour at Westminster could defend Scotland from a destructive Conservative party. However Labour’s actual performance in office 1997-2010 undermined this rhetoric allowing the SNP to emerge as the party most voters trusted to defend Scotland’s economy from the Tories. Although the 2014 independence vote was lost, SNP success in the 2015 general election and the hope for a similar result in the 2016 Scottish elections is keeping the possibility of independence alive. An independent Scotland would, for example, be able to save the remnants of the Scottish steel industry and even expand it. Significantly, the Scottish National Party itself was formed in 1934 from the merger of the left of centre Scottish party (founded in 1928) and the right of centre National party ( founded in 1932), Modern Scottish nationalism therefore has its roots in the period of economic crisis when Scotland’s Victorian industrial infrastructure was facing collapse. If Scotland had become independent at the same time as Ireland could it have managed the transition from Victorian to twentieth century industries better than the UK did? Possibly, but the structural problems would have been ferociously difficult to overcome. To follow the Brassert plan and build a modern integrated coastal plant producing steel for shipbuilding, steam locomotive building and other heavy industries would have risked turning Motherwell, Coatbridge and Airdrie into ghost-towns. At the same time this would have locked Scotland into export based industries during a world-wide depression. New industries, like car-making and light engineering, were growing in England but Scotland lacked a large enough domestic market to develop these sectors. In the 1920s and 1930s, an independent Scotland able to make its own economic decisions was just a dream. Today it is almost a reality. However, the challenges Scotland faces in the twenty-first century are very different from those of the last century. Industries which once employed hundreds of thousands of Scots like coal-mining, ship-building and steel-making are all but extinct. Even the industries which were supposed to provide alternative employment, like car-making at Linwood, have come and gone. Researching the story of steel-making in Scotland has been a very sobering experience. With the benefit of hindsight and thinking about the relatively short life of the Ravenscraig plant, the failure to build an integrated steel works at Erskine Ferry in the 1930s seems like a lost opportunity. On the other hand, Stewart and Lloyds Corby steel works, opened in 1934, was closed by British Steel in 1980, 12 years before Ravenscraig. An Erskine Ferry steel works could well have suffered a similar fate during the Thatcher years or be facing closure now like the Redcar and Scunthorpe steel works in England. Furthermore, while Peter Payne (Colvilles and the Scottish Steel Industry) and Steven Tolliday (Business, Banking and Politics-British Steel 1919-1939) provide an immense accumulation of detail on the agreements and disagreements between the businessmen, bankers and politicians as they decided the future of steelmaking in Scotland, the voices of the workers, trades unions and communities affected are absent. Even nationalisation did little to change this top-down approach to decision making. The current threat to Scotland’s surviving steel works is a consequence of globalisation. The Chinese, having built up their steel industry as the global economy was growing are now trying to keep it going by cutting the price of their steel. This is similar to the problems of the 1930s. And like in the 1930s, the UK government’s belief in ‘free trade’ makes it reluctant to intervene to support the steel industry. Then as now, UK governments were more influenced by the global financial interests of the City of London than the regional and national interests of manufacturing industries. With independence, Scotland will be able to develop economic strategies free from the dominance of London’s financial markets. However this raises the question: what would the economic strategies of an independent Scotland be? As James Foley and Pete Ramand pointed out in their book ‘Yes-The Radical Case for Scottish Independence (Pluto Press, 2014), a Scotland which follows neoliberal economic policies will not be independent of the City of London, since it is a key global centre of neoliberalism. To be effectively independent, to be able to pursue economic policies which best serve the interests of Scotland’s people, an independent Scotland will have to break with current economic orthodoxy. But to do so will be politically very difficult and challenging. The outline of these difficulties can already be seen in the tension between supporters of the SNP and Scottish Green party and RISE/Scottish Socialist party supporters ahead of next year’s Scottish parliament elections. The SNP supporters argue that it is essential to vote SNP for the constituency and the regional list votes or risk splitting the independence vote. People who take this position often go on to argue that discussion and debate about what might happen after independence is a distraction. Independence first is their priority. Scottish Green party and RISE/ Scottish Socialist party supporters reject this approach. Firstly, they argue, even if the SNP win an overwhelming majority in the next Scottish parliament, the SNP are not going to commit to a second independence referendum until they are sure it can be won. In the interim, politics as normal will continue. Secondly, independence is not an end in itself. Rather it is a necessary but not sufficient step towards building a new and different Scotland. This means we have to start thinking, planning and working towards that future Scotland now. By doing this, the transition from a Scotland which is embedded in the UK to one which is not will be smoother and easier. Waiting until after independence before thinking about economic, environmental and social policies is a recipe for confusion and delay- the last thing a newly independent country needs. Thinking ahead also means that tensions and conflicts between different possible Scotlands can be, if not resolved, at least recognised and anticipated. One way to achieve this will be to ensure that the next Scottish parliament contains a diversity of pro-independence parties. This would overcome the sterility of the current Unionist opposition parties and allow the Scottish parliament to start reflecting the politics of an independent Scotland. No doubt this will lead to fierce debates and divisions within the Scottish parliament. But it is only through such democratic debates taking place in the public sphere that a new Scotland will be forged within the shell of the old. While the 1929 Brassert plan to move steel production to a coastal site on the lower Clyde near Erskine Ferry was never implemented could remnants of it could still be seen in the opening in 1979 of Hunterston Ore Terminal? With a direct rail link to Motherwell, it handled iron ore for Ravenscraig steelworks. I am sure this was part of a Government masterplan for integrating industry in the Central Belt. I also seem to remember that in the early ’70s the Young Fabians proposed a regional structure for British Steel with proposals for a Scottish Steel Corporation. There was also the direct reduction plant actually built at hunters ton and “cold commissioned” but never used. Sir Monty Finnieston was the driving force on all that. After completing a marine engineering apprenticeship with Ben Line in 1972, long since defunct but who were then the pride of the merchant fleet with fast break-bulk cargo liners mostly built on the Clyde, I tried to get a job ashore in Scotland. Sixty four job applications produced just four responses, two advising “no vacancies” and two, marginally kinder, advising “no vacancies but we will keep your application on file”. I was told by those in the industry that here was no demand for ships or shipping and particularly passenger ships were finished. I jumped ship and retrained as a chartered accountant and, during my apprenticeship, was part of the liquidation team at Upper Clyde Shipbuilders. So, were those who looked to the future and saw nothing for shipping and ship building right (and all the downstream steel making etc that goes with it). Or was it a failure of vision from government, management and unions? Today there are more passenger ships than at any time in history. Yards in high wage countries (Germany, Finland, Italy, France etc) are building ever more complex cruise ships and specialist cargo and project ships. We threw it all away and the recent announcement of steel closures is the last gasp from a political system surely about to die. Take a walk round the square mile or Canary Wharf or a longer walk from Canary Walk to Vauxhall, that’s where the energy and money has and will be going. A leading banker on the make is quite likely to meet osborne of johnson on the London circuit, and come to an I’ll scratch your back if you scratch mine type of agreement. What chances or influence has a union leader from a steel works in Scotland got with a tory westminster government or the british establishment? More importantly, will this status ever change? I don’t think it has dawned on Scots how unimportant they are to London or how little influence they have, correct me if I am wrong. The only reasons for holding on to Scotland was loss of face on the international stage if Scotland left, oil and defence due to Scotland’s strategic position. The current uk trade and industry minister, sajid javi, is guess what a banker, it’s all he has ever done, that and politics. What leverage were steel men from Cambuslang ever going to have with javi, or will have in future? Clive highlights that it has all been thrown away by the uk, I agree absolutely, but that should not prevent Scots from trying to maintain heavy manufacturing where it is economic. Where it is not economic, we need a strategy to move people on into viable industries. This strategy needs to dovetail with people going through out primary, secondary, special needs, further and higher education systems. It should be blatantly obvious to one and all in Scotland that westminster will not do this for us. Currently there is little opposition to the tories at westminster outwith the SNP. Coupled with this, I have never lived under a uk government that is so cynically and obviously favouring the rich over the poor, will not intervene to save jobs or communities, is itching to go to war for reasons unfathomable, would renew trident at a cost of £170 BN despite food banks on the rise, is ultra anti-European and is actively undermining Scotland’s economy and treating Scots with sheer contempt. Austerity is a long term project for the tories as they shrink the welfare state and public sector permanently. Pulling of resources is conspicuously absent! The 55%, including labour politicians in Scotland need to wake up and assess if this is something they really wanted to be part of and do they wish to inflict british rule in Scotland on future generations? I was across Bernard Street around the same time working at Gibson/Currie Line. I agree that the last 30-40 years has been a massive missed opportunity for Scotland as thousands of ships have been built to carry the ongoing dramatic increases in global trade, and as you note cruise ship growth has also been phenomenal. I recall Ben Line/Thomson’s were still ordering conventional tonnage in the 1970’s even when containerisation was the obvious future, so poor strategy and lack of insight amongst Scotland’s corporate elites did not help, added to the lack of interest from Westminster. Scotland needed investment in large covered shipyards to build new larger boats; Germany, Finland, Italy and France, and Korea/Japan got them, we got the dole. We also needed new port infrastructure for the new and larger types of ship, but we never got that either. There are many extensive modern ports on the continent, all state funded and still publicly owned, but no comparable investment was ever made in Scotland’s central belt seaports, which are today obsolete and derelict, and owned by offshore ‘banks’. More to the point, Clive. Yes, we could have a profitable industry manufacturing bulk carriers and cruise ships, but what no one has ever mentioned during the current trashing of the steel industry in the UK is the strategic necessity for a steel industry in the defence of our country. Will we be able to import Chinese steel to build armaments and ships to defend ourselves in the event of a sea-siege by submarine as occurred in WWII? Steel in the UK (and an independent Scotland) should be nationalised and protected in the interests of the defence of our country. Taking ‘work to the workers’, rather than ‘workers to the work’, was the politically motivated error at the time for several industries, and too many politicians today still don’t know how business works. Hunterston is today still able to handle the largest ore ships, and was the best place to manufacture; transport cost per tonne by sea are a fraction that of land transport. Korea did it right, and China with integrated coastal deep-water plants – and hey presto, the two biggest steel producers and the two biggest shipbuilders in the world. Could we do it right if there is a next time? Production would need to be linked to serving new industries requiring steel e.g. – turbines, electric autos, ships etc. Low cost is the secret – how to deliver low cost! The key cost elements are raw materials, labour, and transport, all influenced by scale economies. Needs debate, as Alistair suggests by “a diversity of pro-independence parties” in what is an excellent and informative article. “The key cost elements are raw materials, labour, and transport” of which I missed ENERGY, and for sure the latter is a major weak link, for now. I have read – and I don’t know if it is true or not – that the decision to invest in both Ravenscraig & Port Talbot in the 50s was a political fudge, with the Conservatives(!) wanting investment in Scotland. The reality is that Port Talbot offered a deep water port, meaning lower costs for incoming and outgoing materials. In contrast Ravenscraig had a steep gradient on the rail line that meant that two locos were required to haul in the iron ore & coal. Mr T- yes, Peter Payne in ‘Colvilles and the Scottish Steel Industry’ (Clarendon Press, Oxford , 1979) pages 375-383 confirms that it was the Conservative government in 1958 which insisted that there should be a strip mall at Ravenscraig as well as in south Wales. Colvilles themselves did not want the strip mill. The Conservatives hoped that the strip mill would encourage job growth in Scotland eg through allowing car production (Linwood) which would give them an electoral advantage over Labour in Scotland. Where will we be how will things look in 10yrs what with the rapidly innovating technology,can anyone even envisage the world we will live in,Dubai/China have both the technology to build houses using a 3d printer at the cost of circa $5k,we have to try and change and adapt,maybe supporting smaller innovative businesses,I think that the re-nationalisation of all the main utilities/housing would give us an opportunity to reduce the cost on business and on emloyees,keep the costs down but free up more money for those in work. Very interesting article about the complex history of the steel industry, having just been on the Dalzell steel march last Saturday. But protecting these plants will present a great challenge – we need action at EU level to level the playing field with Chinese steel and we need to invest in greater energy efficiency. But as Alistair’s article concludes, we also need a proper industrial strategy, where jobs are created in industries that meet our country’s needs. In my view that must be a strategy that puts a transition to a low carbon economy at its heart. I also found the article informative; a good solid piece of work. Within the last few weeks there was a BBC Scottish News item on what I have long believed to be the future for Scottish steel making. To compete on the world stage with volume steel is pointless, but the article focussed on small scale production by electric arc furnaces, of superior quality alloy steels and allied foundry work. Scotland has a few of these micro steel makers left and they are thriving. Investment in greater production of these special alloyed and de-gassed steels will always be worthwhile. On a worldwide scale, engineering makes greater demands on all fronts; “much cheapness” has it’s place, but will never entirely replace “excellence”. Cost is not a problem when only the best will do.